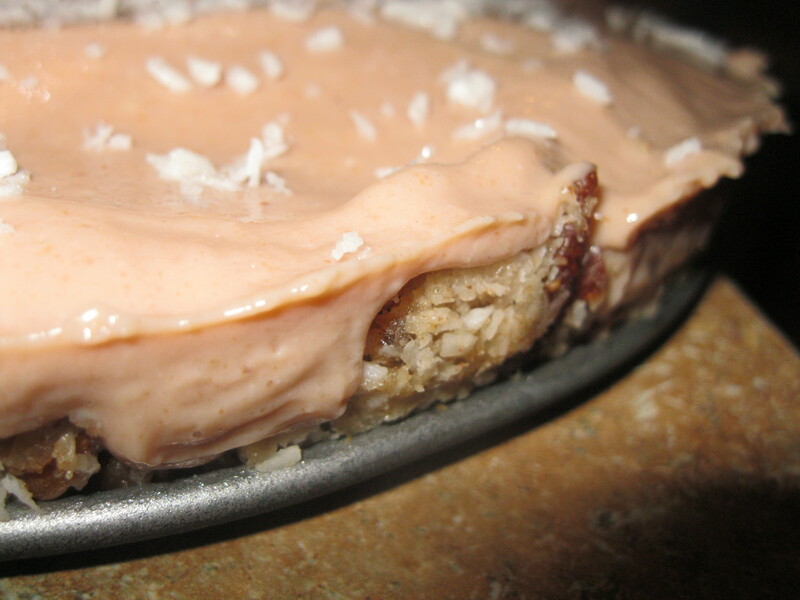 Virtual Vegan Potluck: Guava Cheesecake! Today is a special one because you’re visiting a page that’s part of the Virtual Vegan Potluck! This is the second one that Turning Veganese has been fortunate enough to participate in and it’s a great way to look at lots of vegan food blogs and even some non-vegan blogs that are participating by presenting a vegan dish. I definitely recommend exploring. Use the “go forward” and “go back” buttons at the bottom of the page to participate. I wanted to be sure that Florida culture came out in my Virtual Vegan Potluck contribution so I decided to include some local flare. Guava pastries are a staple in our Cuban heritage, coconut and lime are ubiquitous in Caribbean cuisine so I wanted to include them in this recipe, and pecans are here to represent the Southern elements in South Florida culture. This is an incredibly easy recipe and shouldn’t take you more than 20 minutes to prepare. All you need is a good spring form pan and the ingredients. Mix these until uniform, adding extra water if it’s dry. It should be crumbly and a little sticky. Once you like the texture, moosh it into the bottom of your spring form pan. Put all of that into your blender and blend until smooth. Pour it over the crust and put it into your freezer. I sprinkled mine with some additional coconut to make it extra pretty. It’ll be ready in 4 hours. Remove the wall of your spring form pan and serve. It will get gooey as it melts so put your spring form base on a wide plate to catch anything that falls off the edge. This concludes my part in the Virtual Vegan Potluck event and I hope you’ll visit all the other posts in the chain. If you’re new to Turning Veganese, I hope you’ll visit again. Click on the “go forward” or “go back” button below to see what else the Virtual Vegan Potluck has in store for you! This is Christie and Brent, signing off to head to the Potluck! This dish was my attempt to recreate the dish I had at Noon-O-Kabab a few weeks ago. 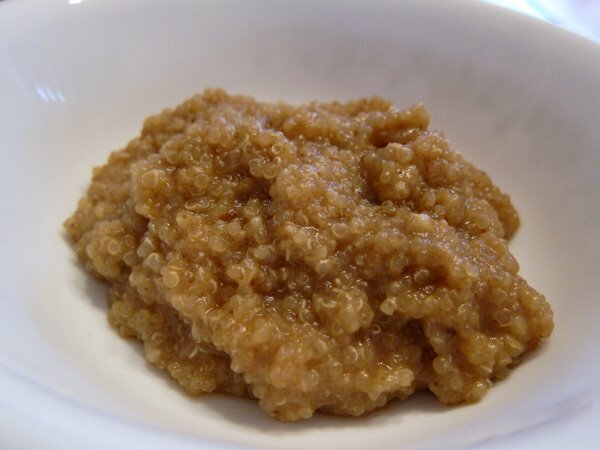 As you’ll see, my creation doesn’t look anything like adas polo, but it was easy to make, made my kitchen wonderfully fragrant, and was a pretty good replication in terms of flavor. 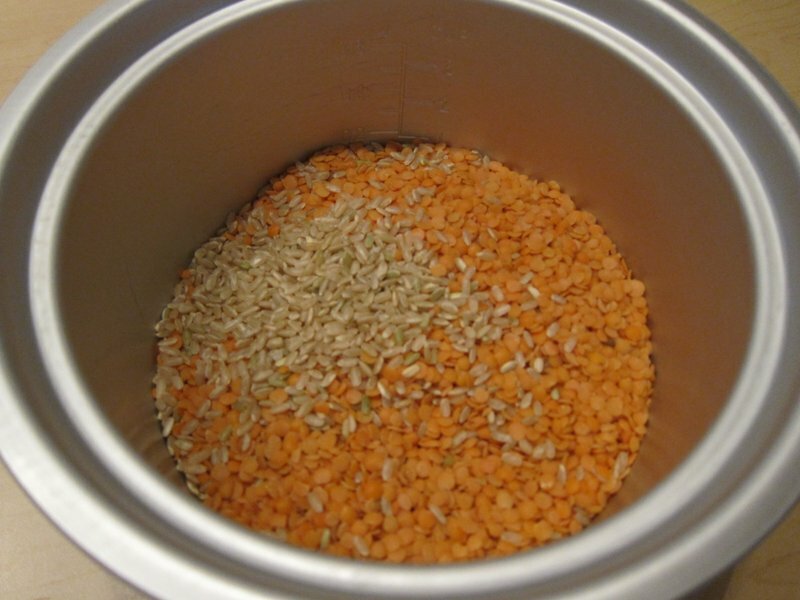 I put the brown rice and lentils in my rice cooker pot, rinsed them, and then added water to fill up to the 2 cup line. I did measure out the water this time around for those of you who don’t have a rice cooker: it was just under two cups of water. I also want to note that the rice was slightly undercooked, so I will go with 2 and a half to 3 cups of water next time. I put the pot in the cooker and then turned it on. Immediately after pushing the “on” button, I prepared the garlic, onion, and dates. 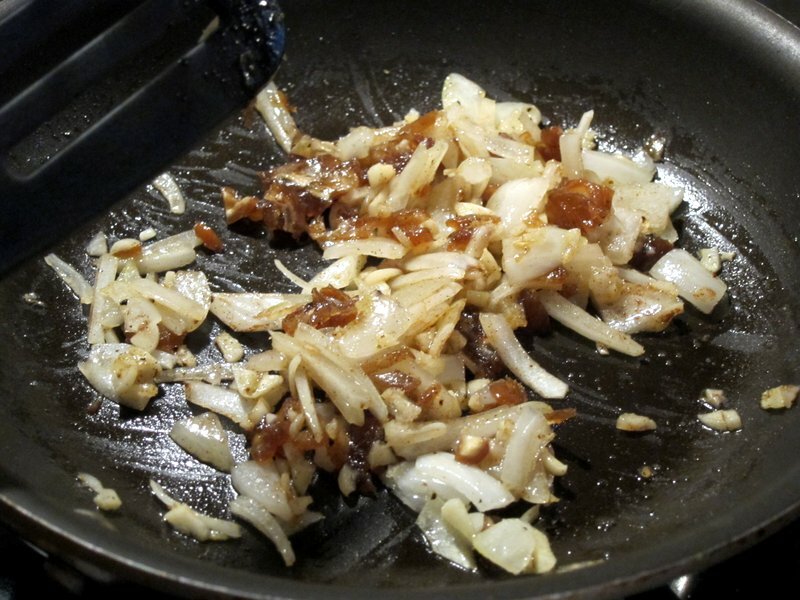 I then heated some olive oil in a pan and browned the garlic, onion, and dates along with the spices. 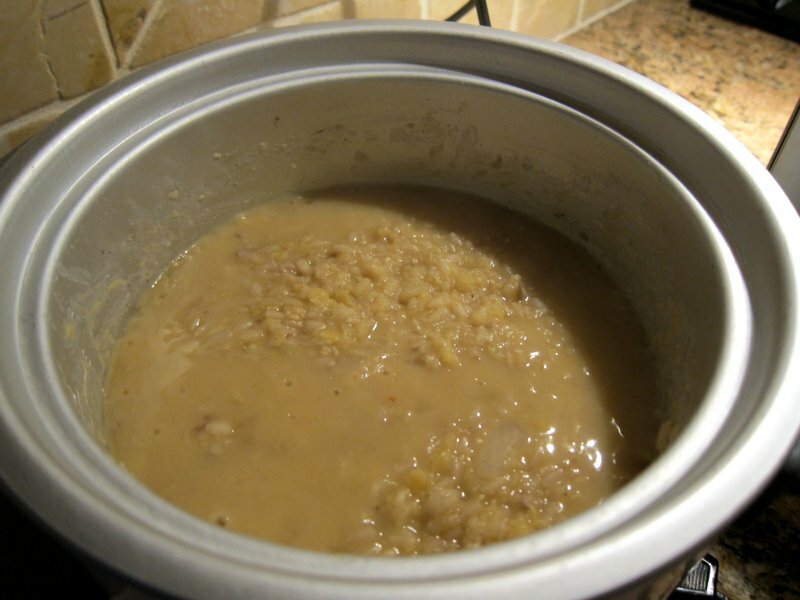 When the onions were nearly translucent, I removed it from heat and then added it to the rice cooker pot, stirring it in to the rice and lentils. 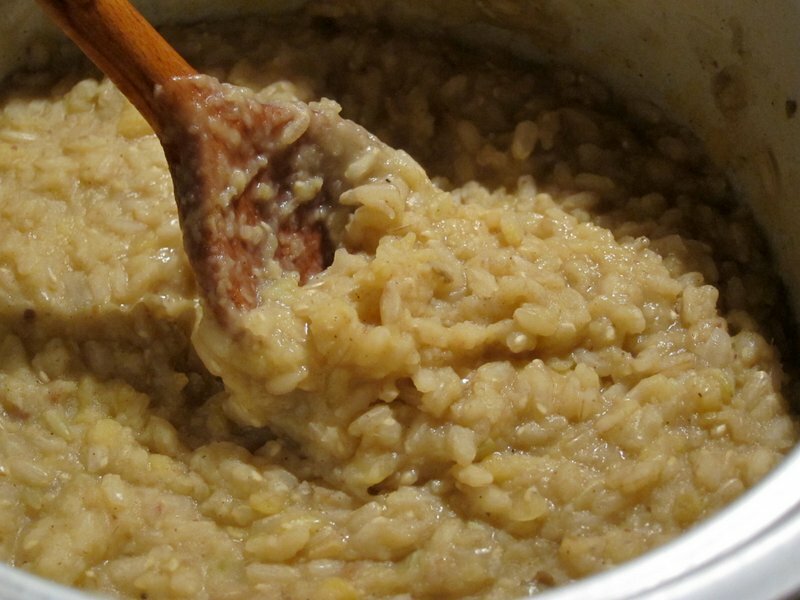 Tip: use a wooden spoon or spatula when mixing stuff around in a rice cooker! Anything metal can scratch the pot and that is no bueno. I stirred the mixture every 5-10 minutes to keep it from sticking. It stuck a bit anyway. Sigh. 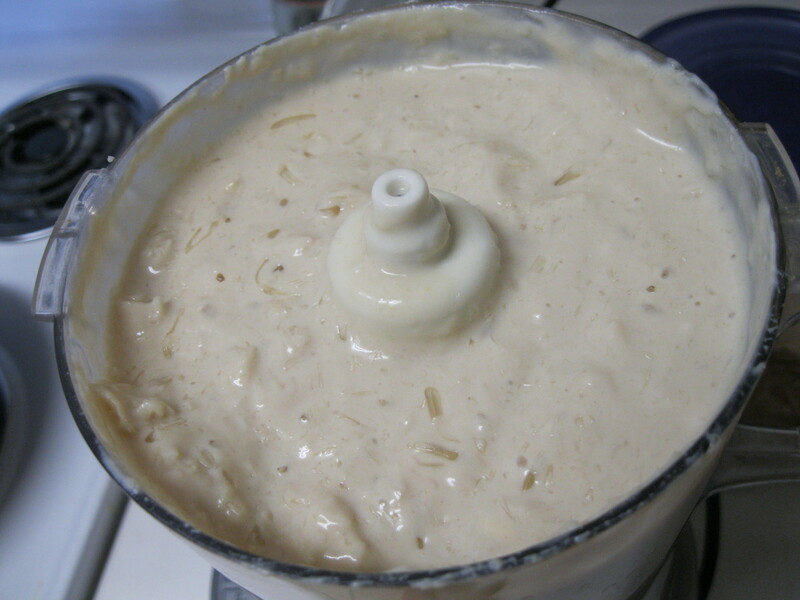 The above photo how it looked when the rice cooker first thought it was finished. I gave it a quick stir and pushed the “on” button again, and it cooked for at least another 5 minutes. Finished! I had a moment of panic at first (uhhh… where did my lentils go! I need my protein and iron!) but the lentils had gotten mushed in with the rice pretty quickly. I sprinkled some salt and pepper on tomato, onion, and bell pepper and broiled it in the toaster oven for about 10 minutes. They were a great accompaniment to the rice and lentils. 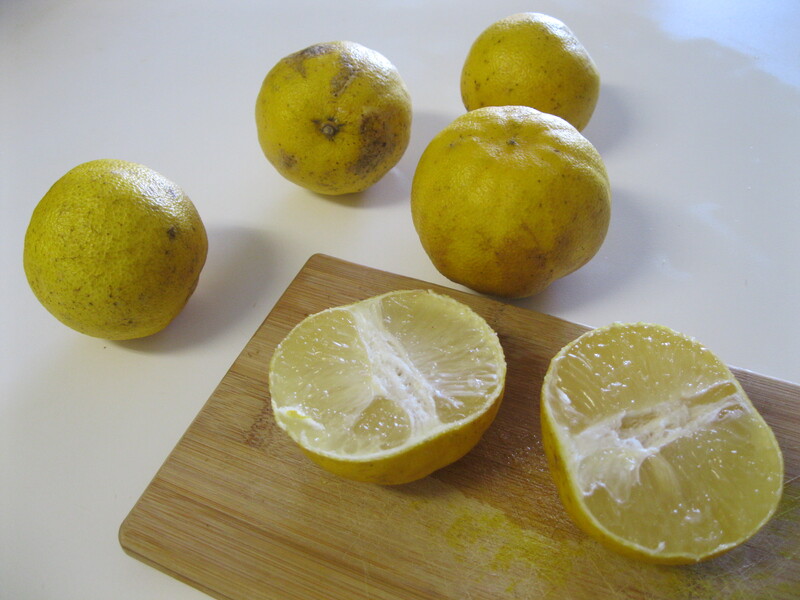 I got some Meyer lemons at our local market. Is there anything these crazy Floridians won’t grow? I combined the lemon juice (be careful to exclude seeds and any rind from the mix as it will make the pie bitter… like mine was /sadface) tofu, half the coconut, cashews, vanilla extract, sugar, starch, gelatin and salt. 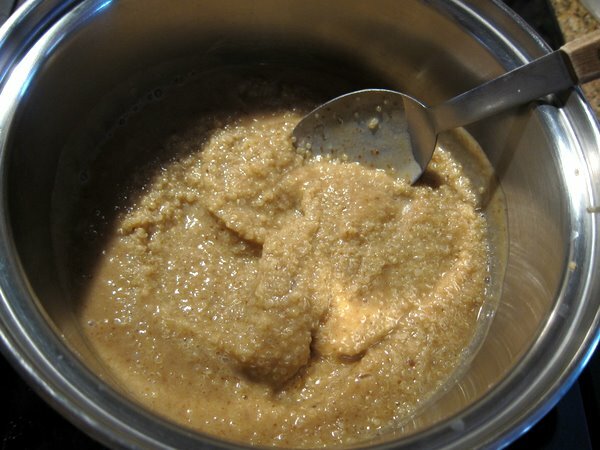 I blended them until they were smooth and then poured them into a saucepan and heated it to marry the flavors. While I did this, I adjusted the seasonings. 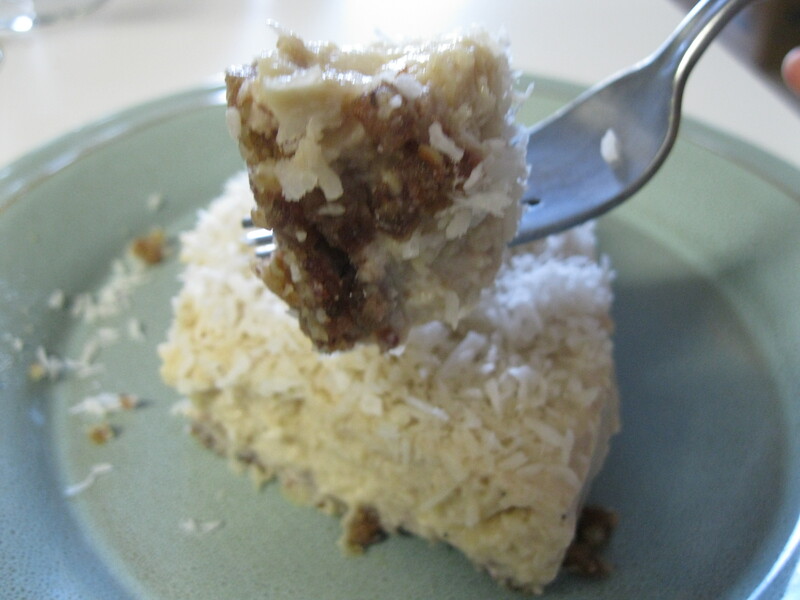 After it was steamy and warm, I poured the mixture into a springform pan over a crust in the style of Melissa’s previous raw cheesecake experiments using another 1/2 cup of coconut in addition to the nuts and dates. I sprinkled the remaining coconut over the top and put it in the freezer for about 20 minutes and them moved it to the refrigerator. The texture was light and smooth. I did get a little too much of the rind from the lemons into the custard and it made the end product slightly bitter but it didn’t stop us from devouring most of it. 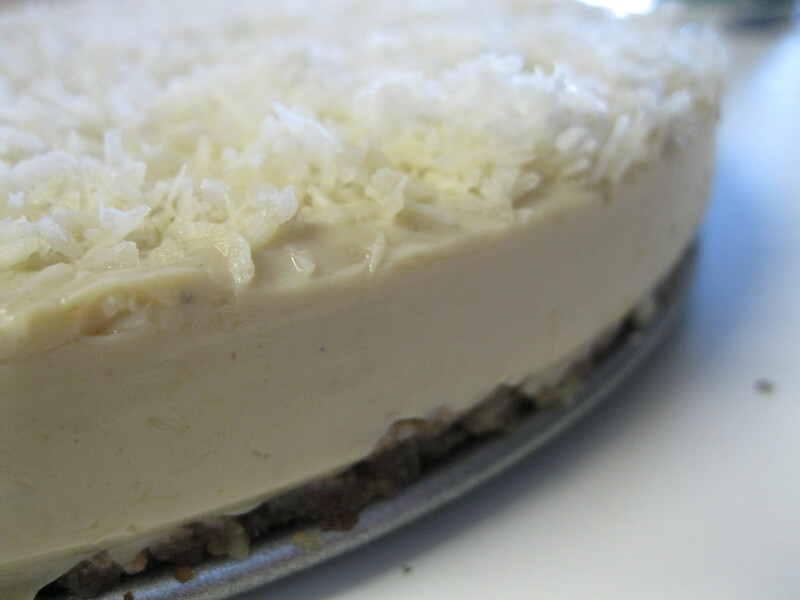 The coconut and lemon were complimented beautifully by Melissa’s date crust. WIN! 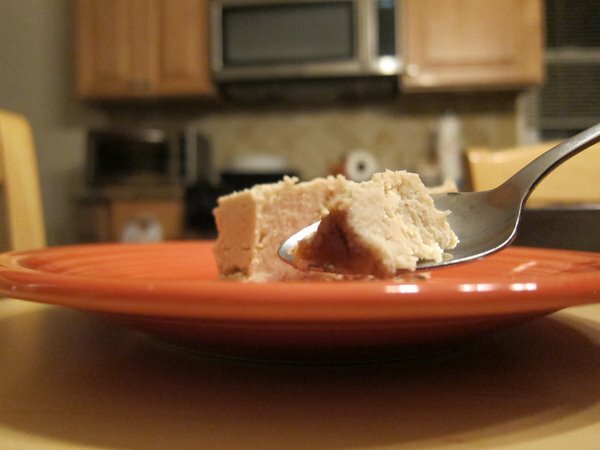 Remember Raw Cheesecake Experiment #1? 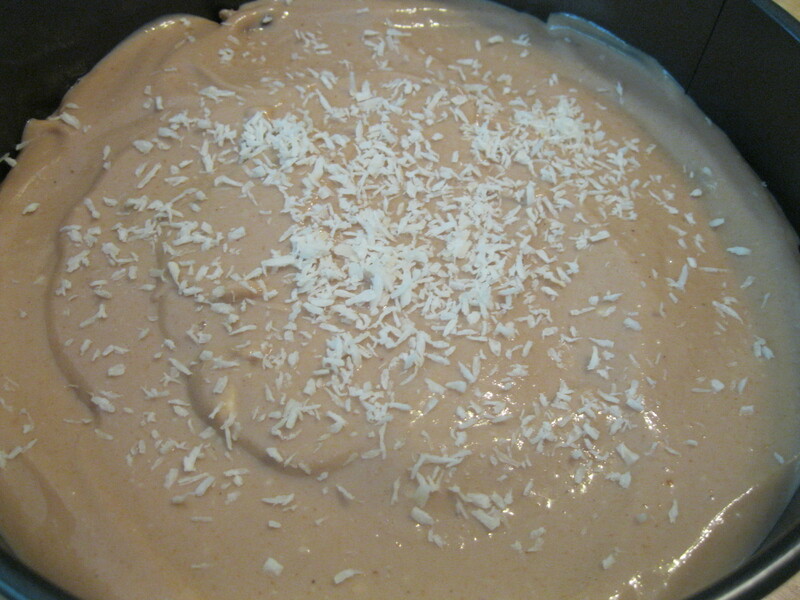 I finally found the time and motivation to try making another raw cheesecake. 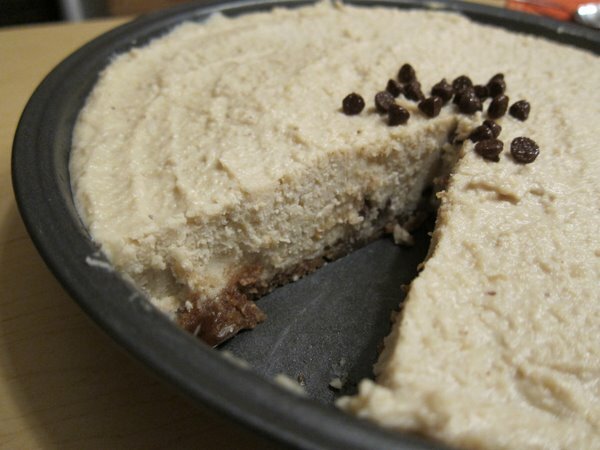 Having learned a lot from my first attempt at making the cheesecake, I made adjustments to both the recipe and technique for my second attempt. On the day you are making the cheesecake, measure out your cashews and soak them in a big bowl. Rinse the nuts: I filled the bowl with water, let it sit for a minute, poured the water out and repeated that 3 times until the water was a little cleaner. I did this a couple more times over the three hours I had them soaking. A little before the three hour mark, I measured out my pecans and then dropped my jar of coconut oil in a bowl with hot water. I popped the dates in the microwave for about 10 seconds so that I could easily get the pits out with my hands. I don’t think it’s necessary to soften them at all since that probably makes them more sticky and more difficult to deal with in the food processor. 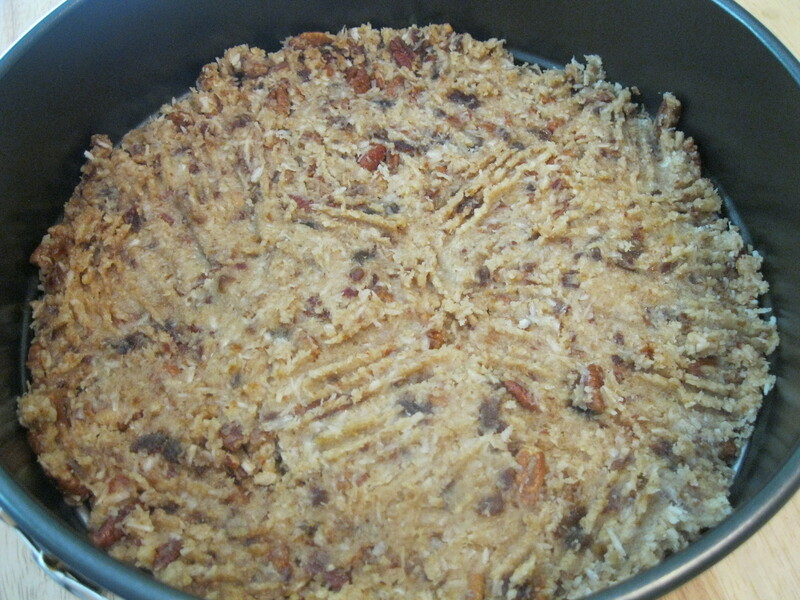 To make the crust, stick all the pecans in the food processor and chop up those suckers. This is important. Once you add your dates, you’re basically screwed out of getting good-sized pecan bits. Once the pecans are in tiny little pieces, go ahead and process the dates. When you’re *almost* close to having it to desired texture, add a pinch of salt. 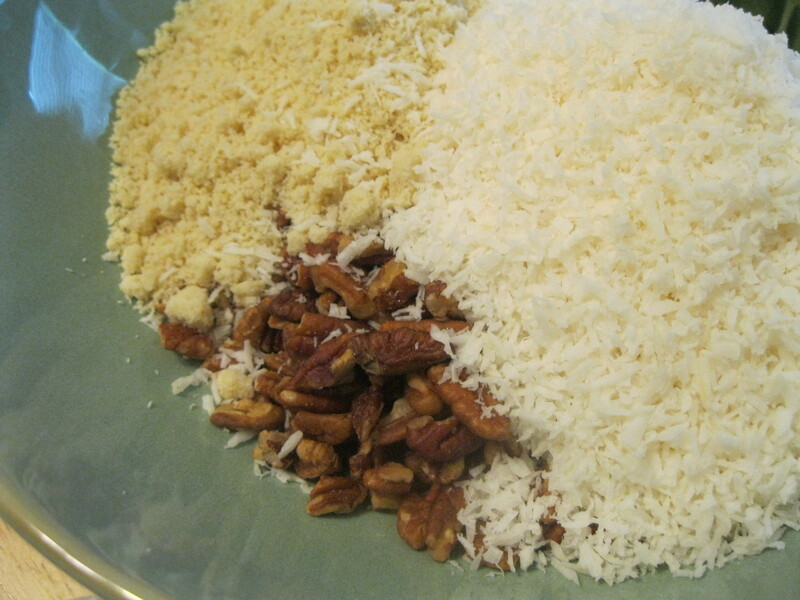 When your crust mixture is done, get your cheesecake pan and sprinkle some coconut flakes evenly on the bottom of it. Then, smash your mixture in there. One thing to note — I will probably use a cup of pecans next time. Now, the fun part. I used a blender for the filling again. I think I’ll try using a food processor for my next attempt. Anyway, drain the cashews. The blending method this time was to add a cup of cashews, add a liquid, add a cup of cashews, add a liquid, etc. It’s odd… I got frustrated because the cashews were just not breaking down into a creamy consistency, but (like the last time I made this) things seemed to magically get to a point where all the chunks were gone and I had my creamy nut filling. 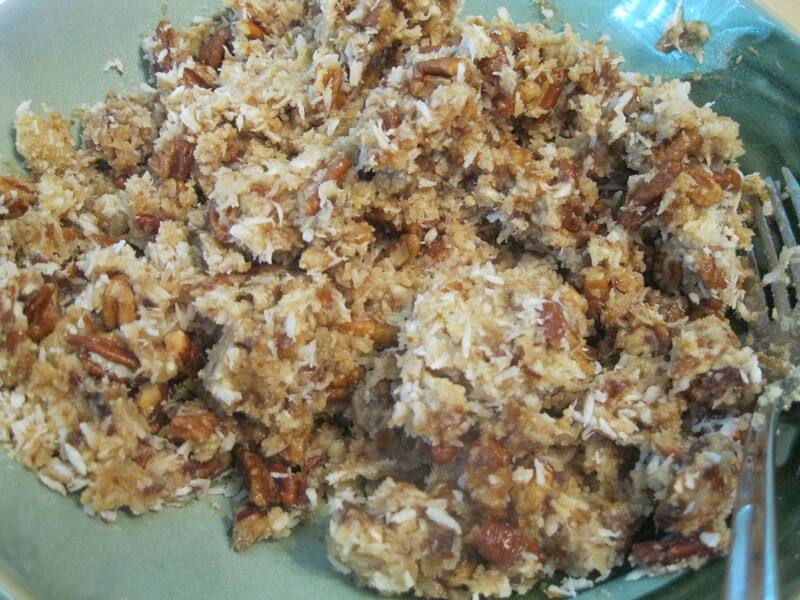 Mix about 1/4 cup of coconut flakes into the mixture if you desire. Once your filling is ready, pour it into the pan. 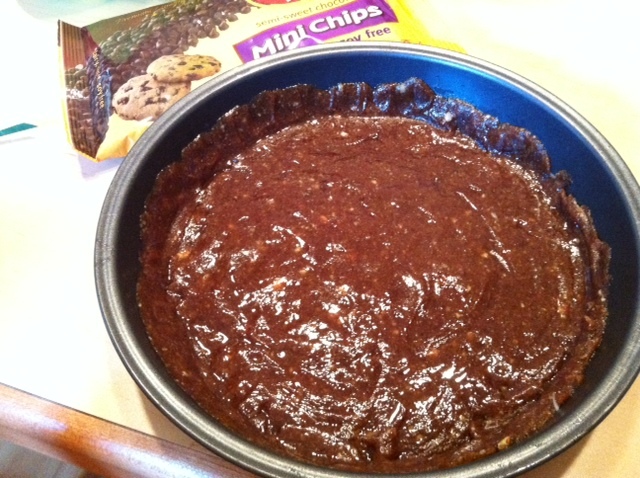 I poured it in about halfway and then decided to add some chocolate chips midway through. I found these mini chips at Whole Foods: they are dairy, nut, & soy free and are very delicious. Highly recommend! I also highly recommend that you be much more generous with the chocolate chips than I was. Next time, I’m seriously going to make it a layer of chocolate chips instead of this sorry sprinkle. Where was I now? Oh, yes. Pour the rest of the mixture into the pan and then even out the top. ‘Tis the season, so I thought it would be cute to decorate the top with chocolate chips in the shape of a snowflake. I clearly failed in my attempt. I stuck the cheesecake in the freezer to set for about 2 hours after which I placed it in the fridge. Yummmm… this version turned out great! I think using pecans for the crust, adding the coconut flakes, and decreasing the lemon juice amount really made a difference. 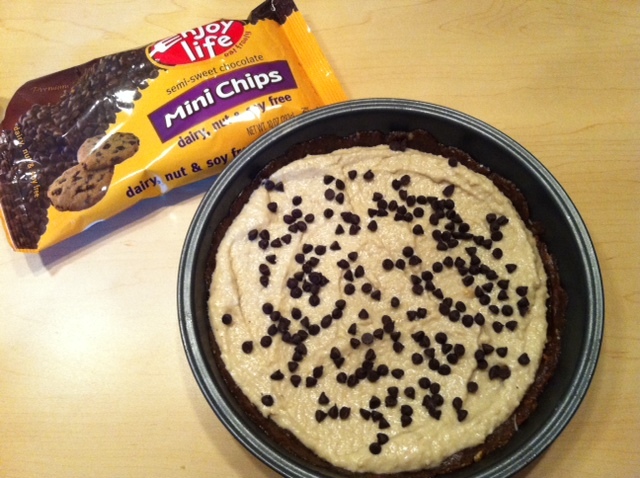 I cannot wait to try this out with some fruit or with a ton more chocolate chips. 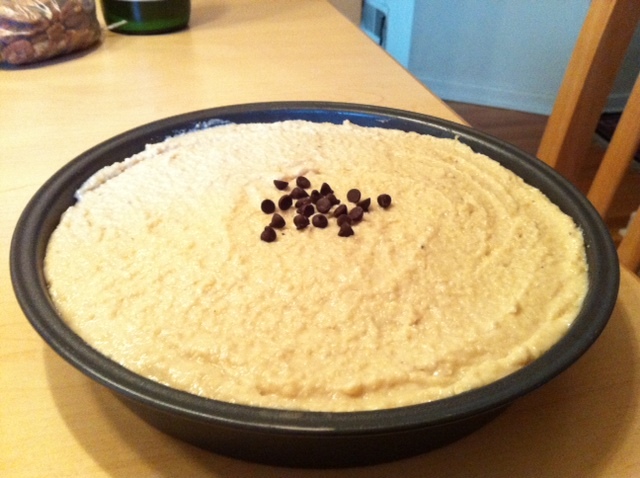 And I love that I can still brag that this is vegan, gluten-free, and soy-free! I am entering week 5 of going vegan, and it is just now that I am starting to really miss the convenience and ease of making eggs for breakfast. Tofu scrambles are a fine alternative, but I was fresh out of tofu this morning and felt mild depression at the thought of having plain toast or fruit. Christie posted a recipe for Quinoa Pudding a few months ago on her Facebook page and I thought today would be the perfect day to try it out. I had to get creative, though, because I was missing one of the key ingredients. 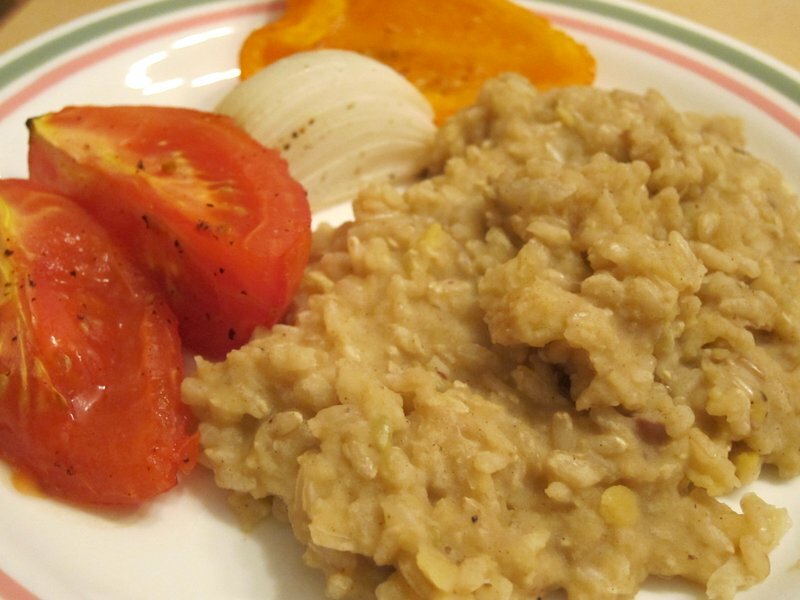 So, here is my variation on Christie’s original quinoa pudding recipe. Rinse the quinoa well and cook. I won’t get much more specific here since I cook quinoa in a rice cooker… follow the directions on the package. Using a rice cooker also allowed me to do everything else without having to keep an eye on the quinoa. 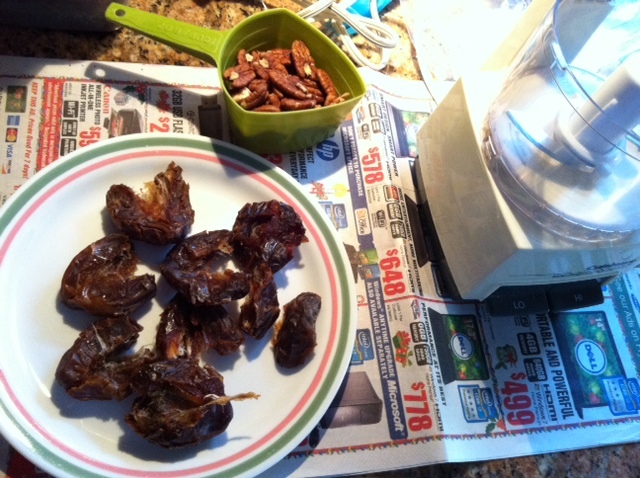 You may want to soften the dates before you start the next step: I took 7 dates, warmed them in a shallow bowl with some water for about 20 seconds to soften them, and then I removed the pits. 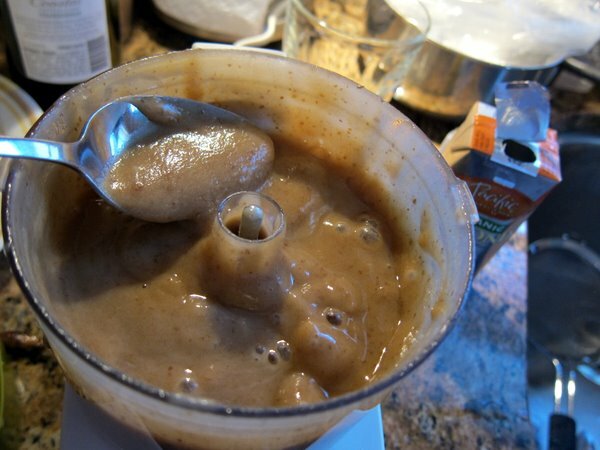 Using a food processor or blender, mix together the dates and almond milk until smooth. I only had one 8 oz package of almond milk, so I added a 1/2 cup of water into the mix. The mixture was really sweet as-is, so I didn’t add any sweeteners. 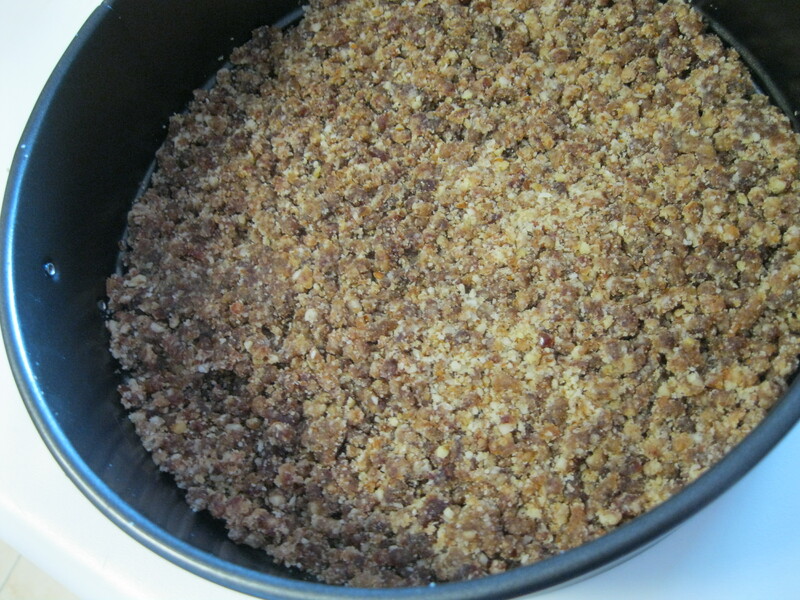 Add the mixture to the cooked quinoa. 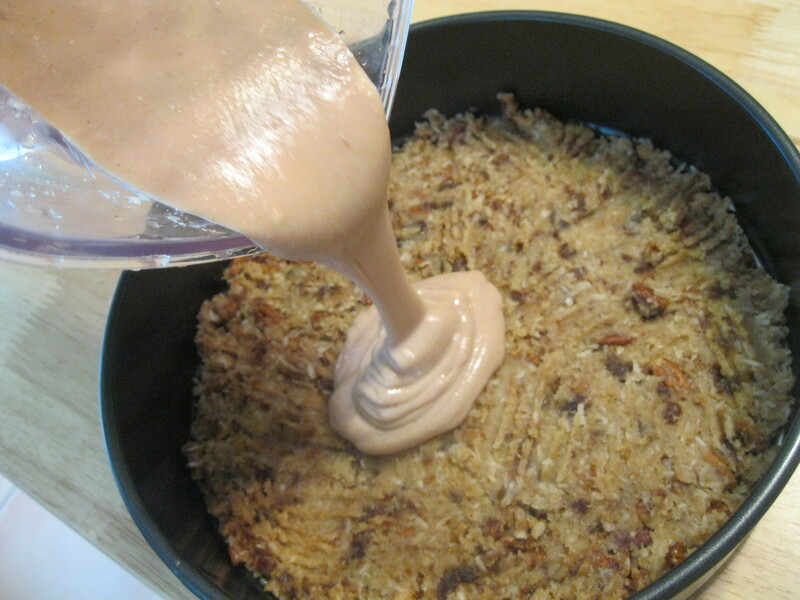 Stir gently over medium heat until it’s creamy, about 10 minutes. While it’s heating up, take a handful of crushed walnuts and then added it to the mix if you’d like. 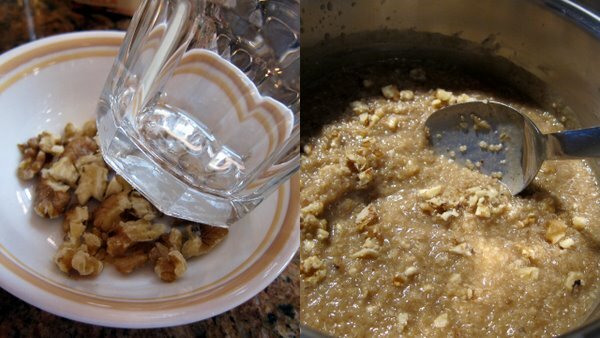 I used the bottom of a glass to crush the walnuts I had. Remove from heat and eat it warm! I wish I had more almond milk so that it would have come out more creamy. My Dad had some and added some regular milk to it (I grew up adding evaporated milk to my oatmeal). Sprinkle cinnamon or add raisins to make it more fun. P.S. I was never a fan of dates, which may explain why I am still single… oh, wait. Wrong blog. I was never a fan of dates until I started using them in recipes. Now, I sort of love them!